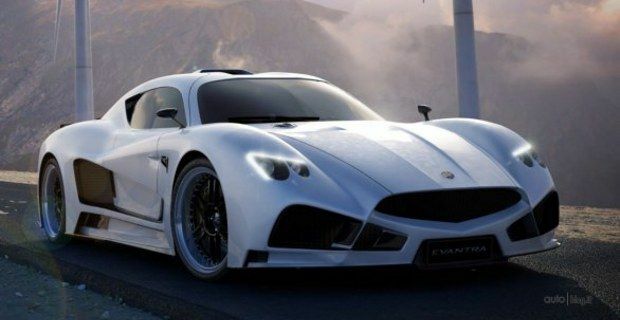 Mazzanti Automobili has released new images of Mazzanti Evantra V8, the new Italian supercar that boasts 701 horsepower and 848 Nm. Made primarily of carbon fibre, the body of Mazzanti Evantra V8 is characterized by aggressive and very personal lines, modern but classic, which come from a racing background and quaintness supercars.The aerodynamics, developed in collaboration with Ysim, a company that provides consultancy services for Formula 1 and the Le Mans Series, has been refined to optimise grip without over-compromising speed performance. The engine is a 7.0-litre naturally aspirated V8 and produces a maximum output of 701 hp at 6,600 rpm and a peak torque of 848 Nm at 4,500 rpm. Mazzanti Evantra V8 uses a dry sump lubrication system in order to lower the engine and also the centre of gravity of the car towards the ground. Some internal components, such as connecting rods and valves are made of titanium, while the rest of the engine is in aluminium. The six-speed Silatronic automatic gearbox delivers the power to the rear axle, which pushes Mazzanti Evantra V8 from 0 to 100 km / h in just 3.2 seconds reaching a top speed of over 350 km / h.
The supercar is equipped with 20-inch OZ alloy wheels wrapped in 305/25 R20 Continental tyres at the back and 255/30 at the front. The powerful braking system, supplied by Italian company Brembo, consist of 380 mm discs with six-piston callipers at the front and 360 mm discs combined with 4-piston callipers at the rear. The manufacturer also offers carbon-ceramic discs as optional, aimed at improving the Mazzanti Evantra V8 performance in extreme conditions. A very interesting feature is the 'mode selector' which allow to set the engine and transmission functions according to different requirements to deliver optimise performance.